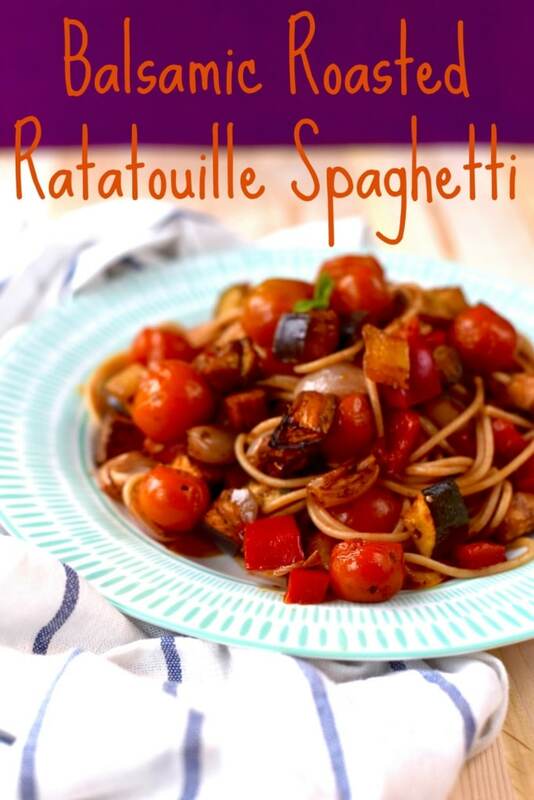 If you are trying to get more vegetables in to your diet, then this Balsamic Roasted Ratatouille Spaghetti is a recipe for you. 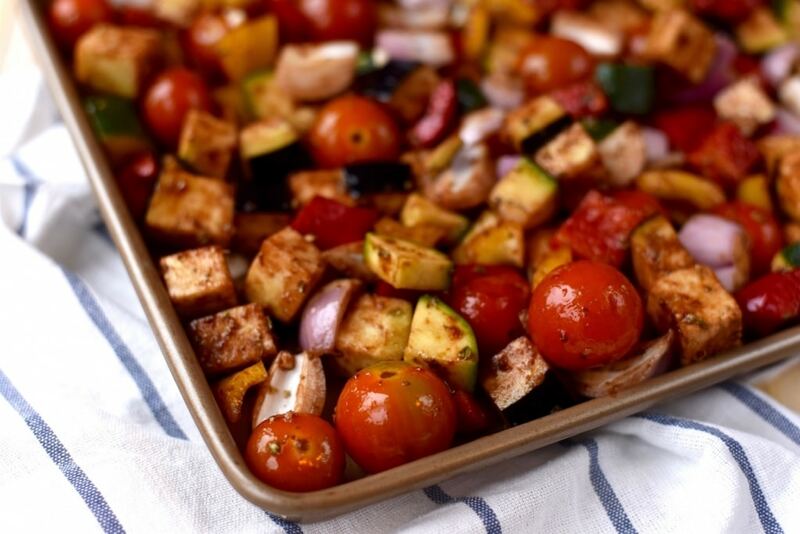 The vegetables are the main star of this dish and roasting them brings out all of the flavour. I think that roasting vegetables is the best way to eat them. The smell fills the kitchen whilst you are prepping the rest of the dish and roasting them releases all those delicious flavours and they start to caramelise. That definitely makes it a whole lot easier to get your 5 a day. We are doing really, really well with our vegetable consumption since Dannii went Vegan. If a meal isn’t bursting with vegetables, then we haven’t been successful. I think that is the best thing about going meat free, oh, and the fact that our skin is a lot better. We are also doing pretty well with our balsamic vinegar consumption as well. We got sent a really expensive bottle of balsamic vinegar to try a few weeks ago. The kind of stuff that you would never think to buy yourself, because it is “just” vinegar, but I am totally convinced that good balsamic is worth paying for. It is so much thicker, and it has so much flavour too. We might need to start setting myself a monthly balsamic budget or something. Although I am not vegan, I am eating pretty much a 98% vegan diet and I am loving all the different flavours, that aren’t overpowered with meat and dairy. 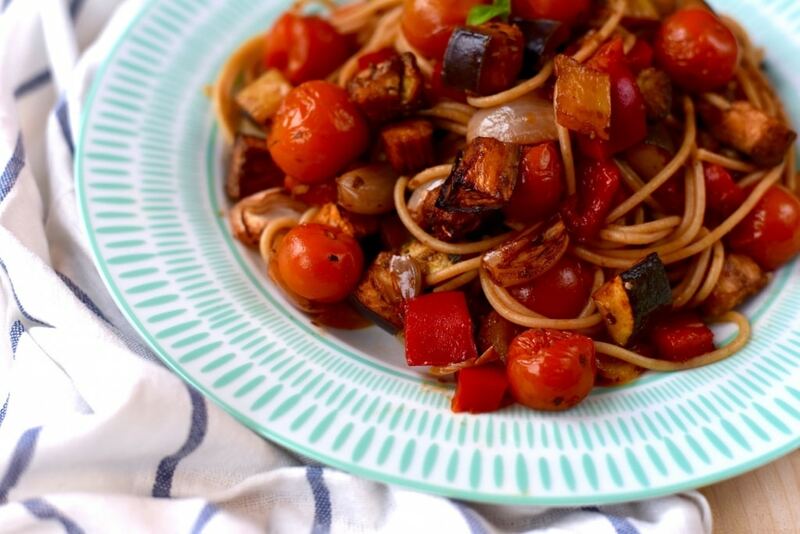 I used to throw loads of cheese on top of my pasta dishes, to add extra of flavour, but we have found healthier ways of adding flavour now and that usually includes balsamic vinegar and a whole lot of herbs. Flavour does not have to mean calories! 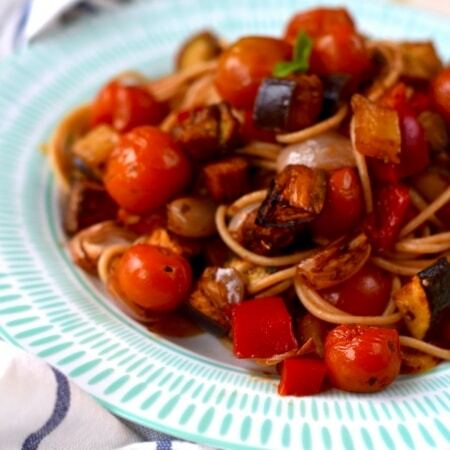 It’s been mentioned before, but I am not a huge fan of aubergine (eggplant). I am not sure what it is, maybe the texture? But it’s a different story when it is roasted, especially in balsamic. Am I starting to sound a little bit obsessed with balsamic? I just love the stuff! This isn’t an advert for balsamic either, just sharing what we love! This is one of those dishes that you can literally throw in anything you like. 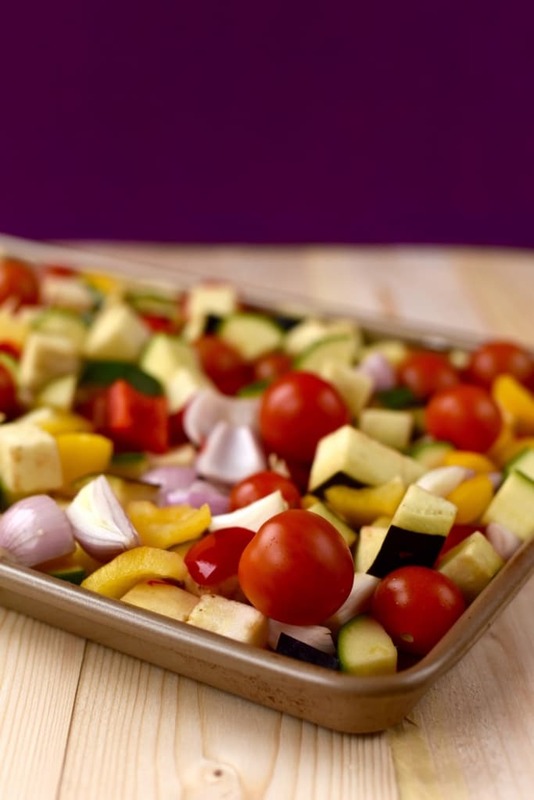 Have some veggies that need using up? Throw them in. Buy some king prawns on offer? Throw them in too. Or, have some leftover chicken? Shred it and throw it in to this dish. A little parmesan would go a long way too, but it really doesn’t need it. 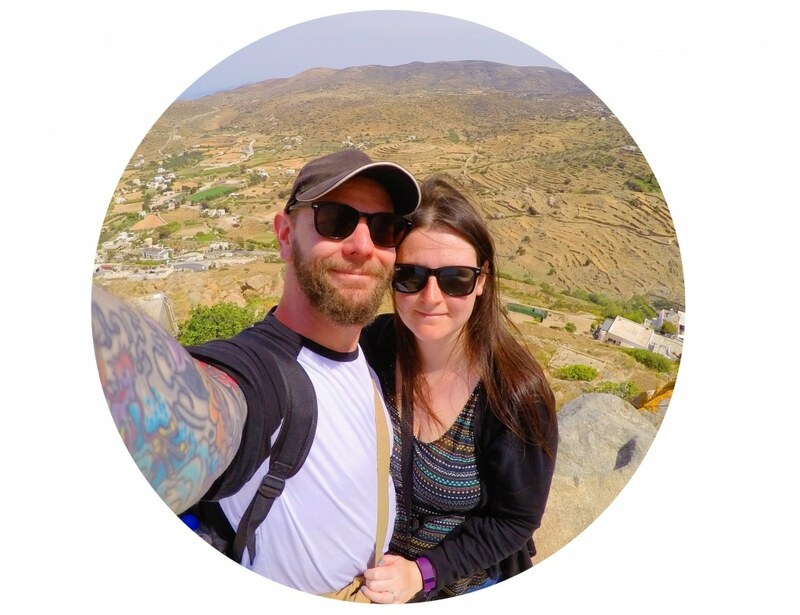 We are going to be sharing lots of dishes that can be easily adapted to suit everyone’s tastes. 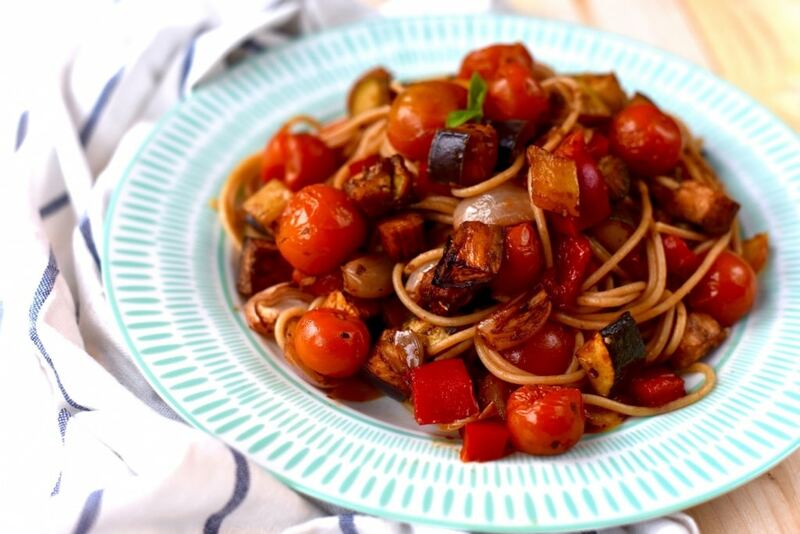 If you are trying to get more vegetables in to your diet, then this Balsamic Roasted Ratatouille Spaghetti is a recipe for you. Put all of the vegetables in to a large bowl. 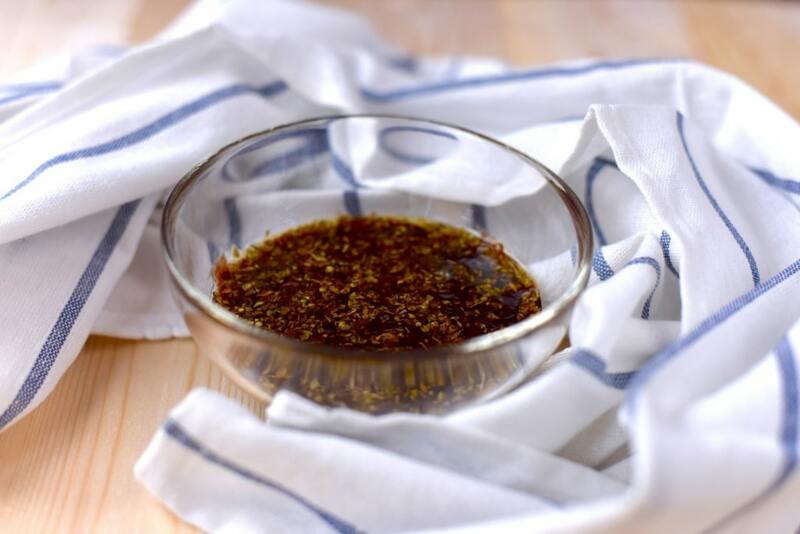 In a smaller bowl, mix the olive oil, balsamic vinegar, tomato puree, garlic, oregano and salt and pepper. Pour over the vegetables and mix well. 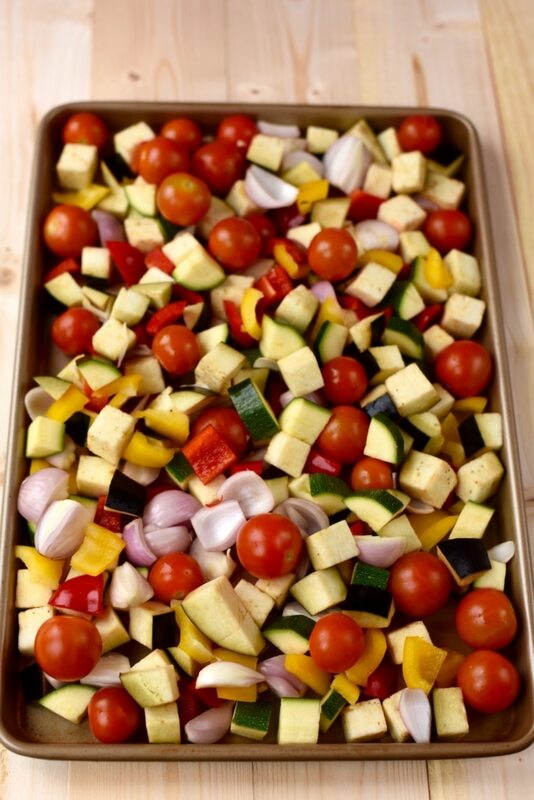 Put the vegetables in a single layer on a baking tray lined with grease proof paper and cook in a preheated over at 170°C for 45 minutes, mixing half way through. 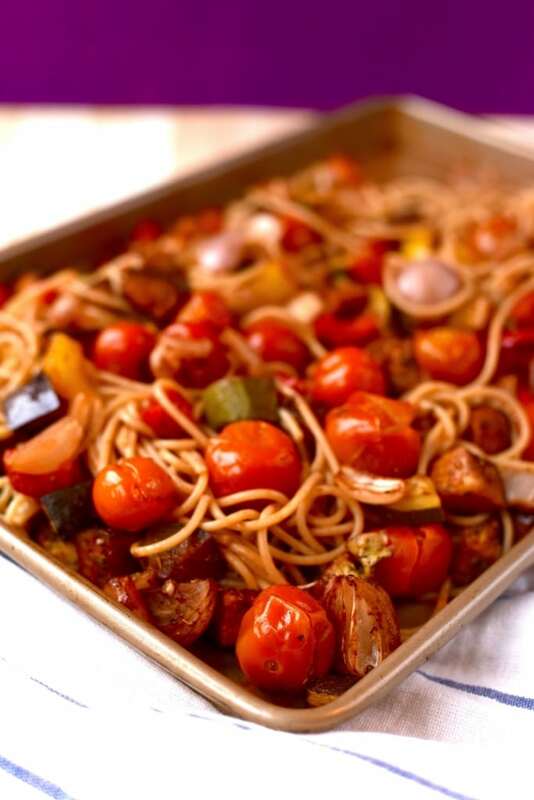 12 minutes before the vegetables are cooked, put the spaghetti in a pan of boiling water and simmer until cooked and then drain. Put the spaghetti in a large bowl and then add the vegetables and mix well. Divide between 4 bowls and top with fresh basil. This looks so lovely! 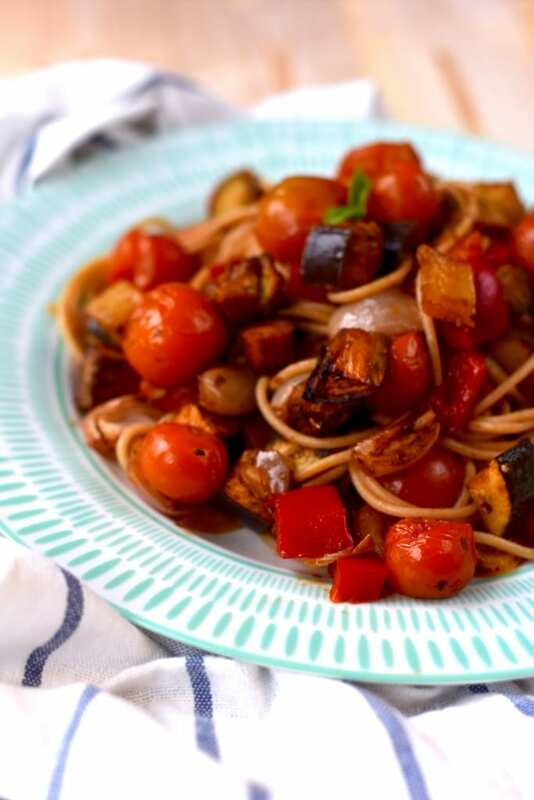 I like to add balsamic vinegar to my pasta sauces to give it that sweetness without adding any sugar.